Segmented linear dsRNA genome. Contains 11 segments coding for 12 proteins. Segments size range from 667 to 3,302nt (SiRV-A/SA11). Genome total size is 18,550 bp (SiRV-A/SA11). The viral mRNAs contain 5'-methylated cap structures but lack polyA tail. Instead, rotavirus mRNAs have at their 3' end a consensus sequence (UGACC) that is conserved in all 11 viral genes. Co-infection of cells with different rotavirus strains belonging to the same serogroup A, B or C undergo mixing of the genome segments (genetic reassortment). The dsRNA genome is never completely uncoated, to prevent activation of antiviral state by the cell in response of dsRNA. The viral polymerase VP1 synthesizes a capped mRNA from each dsRNA segment. This capped mRNA is translocated to the cell cytoplasm where it is translated. NSP3 may act as a translation enhancer for viral gene expression. Segment 11 of rotaviruses A (but not rotaviruses C) encodes a second out-of-frame protein NSP6 by leaky scanning. Rotaviruses C NSP3 seems to produce two proteins by ribosomal skipping. Rotaviruses B segment 5 contains at least two potential ORFs. Segment 5 of the novel adult diarrhea virus, ADRV-N (nongroup A, B, C) may be cleaved into two products. 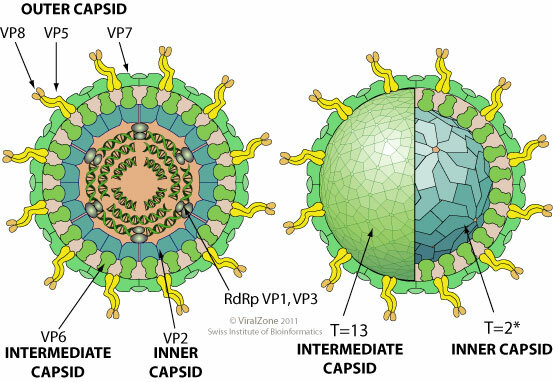 Attachment of the viral VP4 protein to host receptors mediates clathrin-mediated endocytosis of the virus into the host cell. Particles are partially uncoated in endolysosomes (loss of the VP4-VP7 outermost layer), and penetrate into the cytoplasm via permeabilization of host endosomal membrane. Early transcription of the dsRNA genome by viral polymerase occurs inside these now double-layered particles (DLPs), so that dsRNA is never exposed to the cytoplasm. The nascent (+)RNAs are extruded into the cytoplasm and serve as template for viral proteins synthesis. 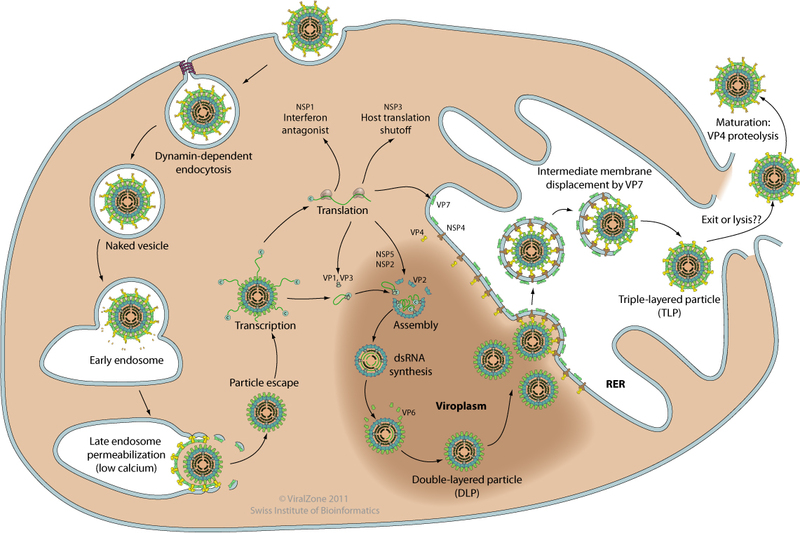 Progeny cores with replicase activity are produced in cytoplasmic virus factories (also called viroplasms). This implies synthesis of complementary (-)RNA and initial steps of viral morphogenesis. Late transcription occurs in these progeny cores. At the periphery of virus factories, these core are coated with VP6, forming immature DLPs that bud across the membrane of the endoplasmic reticulum, acquiring a transient lipid membrane which is modified with the ER resident viral glycoproteins NSP4 and VP7; these enveloped particles also contain VP4. 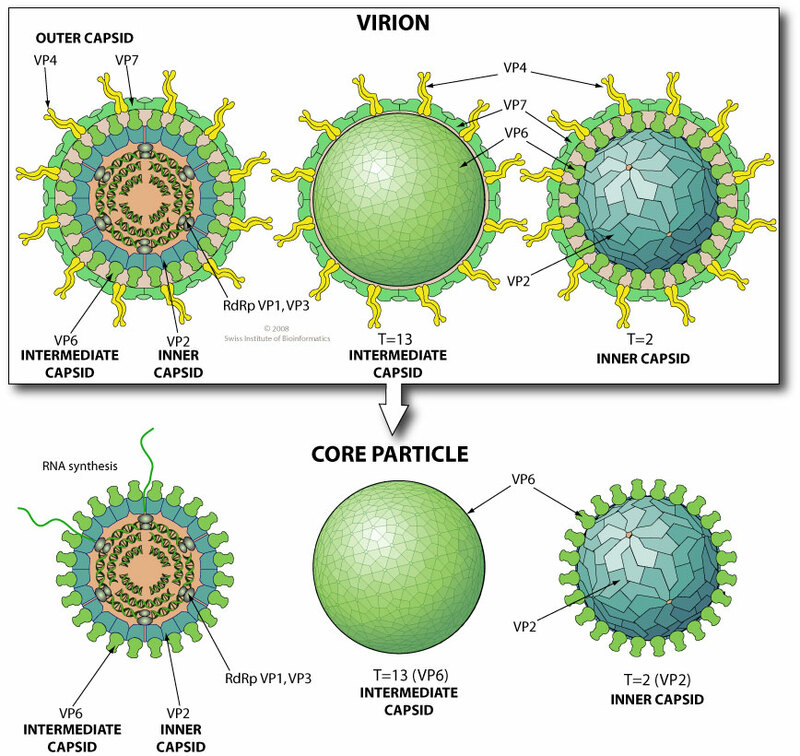 As the particles move towards the interior of the ER cisternae, the transient lipid membrane and the nonstructural protein NSP4 are lost, while the virus surface proteins VP4 and VP7 rearrange to form the outermost virus protein layer, yielding mature infectious triple-layered particles. ETYMOLOGY Rota: from Latin, “wheel”. NATURAL HOSTS Human, Vertebrates. Rotaviruses generally exhibit substantial host-range restriction. TROPISM Rotaviruses infect the mature absorptive villous epithelium of the upper two thirds of the small intestine. After replication in the upper small intestine, infectious particles are released into the intestinal lumen and undergo further replication in the distal areas of the small intestine. Infection is generally confined to the intestinal mucosa. ASSOCIATED DISEASES Gastroenteritis Symptoms are principally induced by the viral enterotoxin NSP4. VACCINE Rotarix (GlaxoSmithKline) and Rotateq (Merck) vaccines. Rotarix is a live attenuated rotavirus serotype G1 P1A8. RotaTeq is a bovine (WC3)-human reassortant vaccine composed of five strains, each containing a human rotavirus gene encoding the VP7 (serotype G1, G2, G3, or G4) or the VP4 (serotype P1A8) neutralizing proteins. NSP3 protein evicts cytoplasmic poly(A) binding protein (PABP) from translation initiation complexes and thus “shuts off the translation of cellular polyadenylated mRNAs”":/by_protein/1579. Inhibition of host poly(A)-binding protein by virus -> Host translation shutoff .